Travel nurses have an exciting career. After signing with an agency, they are assigned to work areas within their specialty. Assignments can last from eight to thirteen weeks, sometimes longer if needed. Nurses can work within their state, outside their state, or even out of the country. Nurses interested in travel nursing may have questions about licensing; specifically, how are licenses recognized if practicing in another state. Depending on the state, new licensure is not necessary. 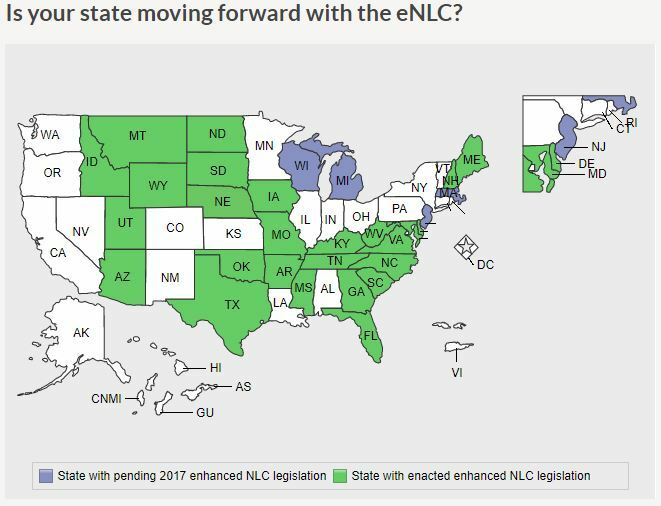 The National Council of State Boards of Nursing (NCSBN) developed the Nurse Licensure Compact which is an agreement between specific states to recognize nursing licenses without having to apply separately for licensure in another state. In other words, a nurse living in a "compact state" (one which is part of this agreement) can practice in another compact state without having to obtain additional licenses. There are now uniform licensure requirements which must be met when seeking a multistate license under the compact agreement. States that participate in the compact agreement can be found on the NCSBN website. If not part of the compact agreement, some states allow nurses to obtain temporary licenses. Temporary licenses are valid for specific lengths of time, so nurses must visit each state's Board of Nursing website to determine specific temporary license requirements. If extending the assignment past the temporary license time frame, nurses must apply for a permanent license. Additionally, applying for temporary licenses can take time to process- nurses should apply as far in advance as possible. If traveling to a state that does not grant licensure by endorsement (temporary licensure) or participate in the compact agreement, nurses must apply for a permanent license. As with temporary licensing, this process can take time and should be started in advance. It's important to find out if additional requirements such as continuing education or letters of recommendation are needed for licensure as well. Information regarding state requirements and licensure can be found on the individual state's Board of Nursing website. Travel nursing agencies have recruiters that can assist in licensing as well.